While I was in Canada I started coming down with a cold. 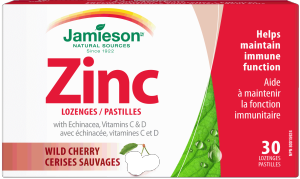 I’ve used Zicam zinc tablets to good effect in the past, so I found a Canadian substitute from a brand called Jamieson. In typical Canadian fashion, the packaging was bilingual. The description read, in English and French, “Lozenges / Pastilles.” Now I’ve always associated lozenges with semi-opaque hard candy, like cough drops, so I was surprised to find fast dissolving tablets in the package. This made me curious about the definition of lozenge, so I looked the word up. Originally in English as a term in heraldry; meaning “small cake or tablet (originally diamond-shaped) of medicine and sugar, etc., meant to be held in the mouth and dissolved,” from 1520s. Well, that’s interesting. The English word has a French origin. On a package that also has the French word. This made me check up on the origin of the French word for tablet, pastilles. Marie de Medici was married off to France’s Henri IV, who hated his homely blond wife and presided over a court whose courtiers mocked her as “the fat banker.” Marie escaped the tribulations of her hostile marriage and surroundings by comforting herself with food, especially sweets. She brought Giovanni Pastilla, the Medici clan’s confectioner, to the French court, where his concoctions delighted the French as much as their queen. The term bonbon – good good – originated from the royal children’s nickname for his wares, as did the word pastille, the small, sugared fruit tablets Pastilla specialized in. So the English word lozenge comes from French but the French word pastille may have an Italian origin. I know it’s trivial, but I find it humorous.